Duffy can cuddle up to share baby's dreams and will be a partner in all adventures when baby grows! 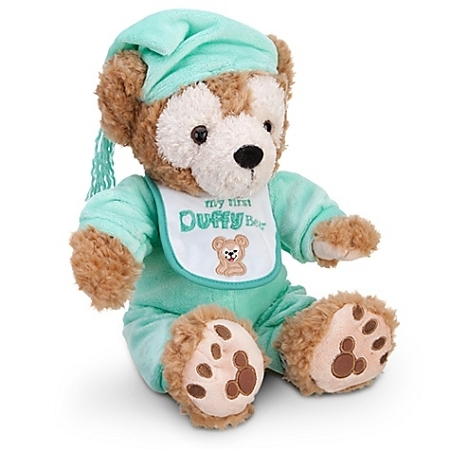 ''My First Duffy Bear'' is a lovely gift thanks to Duffy the Disney Bear looking like a soft, fuzzy, huggable baby in his long johns, bib and nightcap. One day, Mickey Mouse was getting ready to set sail on a long sea voyage. Minnie Mouse made him a special teddy bear to take with him so he would never get lonely! Mickey loved the bear and affectionately named him Duffy. As Mickey and Duffy sailed on their journey, they visited all sorts of exciting places and made new friends along the way. At the end of their travels, they sailed back home for a wonderful reunion with Minnie. Mickey and Duffy shared their magical memories with Minnie, who was thrilled that her teddy bear was such a great friend and companion for Mickey! Now, after traveling around the globe, Duffy the Disney Bear has found his way to Walt Disney World and Disneyland Resorts! As every child's favorite teddy bear comes to life, Duffy affectionately greets Guests at Epcot's World Showcase and Disney California Adventure's Paradise Pier. Now available online, Duffy is so excited to join you and share all of your wonderful adventures! So, where will you take Duffy?